In Memory of John W. Thomas, Jr., a True Pioneer | Sonny Merryman Inc.
Former President of Thomas Built Buses, John W. Thomas, Jr., passed away Thursday, October 26, 2017 after a short illness. Thomas began his career at Thomas Built Buses in Highpoint, North Carolina as an engineer. He later moved into sales as a regional sales manager and worked his way up to lead the company’s sales effort. Thomas was promoted to President and later CEO/Chairman and continued to lead the company’s growth to become the largest US manufacturer of school buses. Thomas was also a 1949 graduate of Virginia Tech, earning his B.S.in Manufacturing Engineering. Floyd Merryman, President & CEO of Sonny Merryman Inc., described Thomas as a true pioneer in the school bus industry who helped pave the way for much of the innovation and success of Thomas Built Buses in current day. 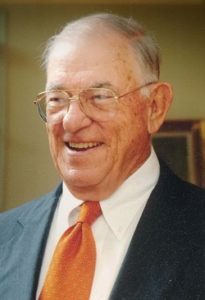 View John W. Thomas, Jr. obituary at www.andrewsmortuary.com.